Currently we do not have any puppies available. When we do we will post their availability here on our website. All of the puppies we sell are provided with with a health guaranty, the necessary vaccines and vet care prior to delivery to your family. If you are interested in obtaining a new dog for the show ring or as a family pet we welcome your calls and emails. Even if you wish to find out if a beagle is the right breed for you we want to hear from you! We can be reached by e-mail. 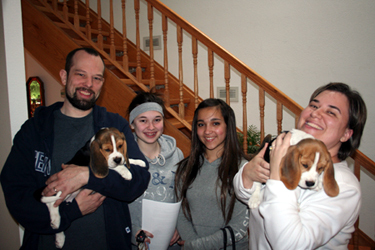 We look forward to putting a smile on your face with an adorable beagle puppy from Cherry Creek Beagles, "The Home of the Merry Little Hounds!"